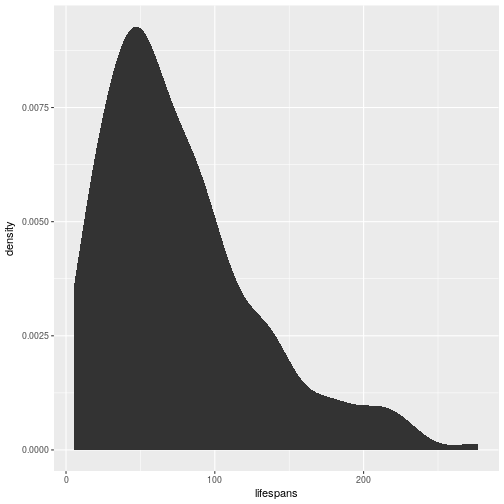 This is part 2 in a series on statistical theory using R. For part 1, go here. This tutorial concerns itself with MLE calculations and bootstrapping. It is thought that this data of bacteria’s lifespan may follow a gamma distribution. Confirm this assumption through an exploratory plot. Using an appropriate function from the MASS library, evaluate the log-likelihood for this dataset. From this evaluation, also obtain MLEs for the shape and rate parameters. Obtain the standard errors for the shape parameter. Use a wald test to calculate a test statistic to determine if the shape MLE differs from 2 at the 5% level. Generate an exact p-value for this test. The goal parameters of our bootstrap are the variance. From the new dataset below, calculate the variance. Create a single bootstrapped sample and calculate the variance from this. Turn your solution from step 8 into a for loop, generating 100 bootstrapped samples and test statistics. Calculate a 95% confidence interval for your bootstrapped test statistic.